The Moosewood Collective’s latest cookbook deserves a place next to the seminal vegetarian Moosewood Cookbook that was published in 1974. Moosewood excels at creating recipes that layer flavor upon flavor. Each chapter is filled with innovative recipes that pull in techniques and ingredients from around the world, such as spicy phyllo samosas with spinach, fresh mint and cilantro; romaine “tacos” with sweet chili sauce; and Jamaican jerk tempeh patties. The cookbook contains a wide variety of salads, such as a Mediterranean potato salad flavored with za’atar, olives, and artichoke hearts and an invigorating winter salad of greens with citrus-date dressing. 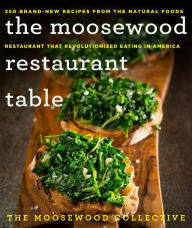 The Moosewood Restaurant Table: 250 Brand-New Recipes from the Natural Foods Restaurant That Revolutionized Eating in America. Moosewood Restaurant in Ithaca, NY, has been serving up influential vegetarian cuisine since 1973. It has also given rise to more than a dozen acclaimed cookbooks, many of which are mainstays of library cooking collections. Following Moosewood Restaurant Favorites, this new title features 250 recipes for globally influenced and liberally spiced dishes, including Roasted Carrot Hummus, Italian Cannellini Burgers, Japanese Curry, and Coconut Rice Pudding with Mangos. While its predecessor contained fish dishes, this volume has only vegan and vegetarian foods and also highlights lesser-known fruits and vegetables. There are more choices for gluten-free eaters than in some of the older Moosewood cookbooks. VERDICT The Moosewood editors dependably deliver even more enticing recipes, all of them useful to home cooks and pantry-friendly.